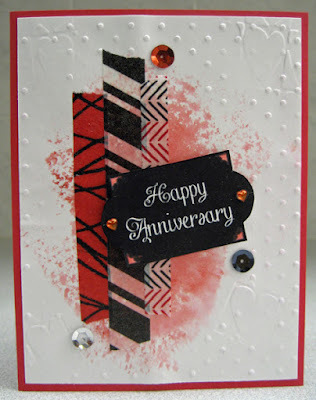 For this card I used Distress ink for the watercolour background using my DIY foam stamp. I put on three strips of washi tape - the two on the right are commercial and the one on the left is handmade by me using red tissue paper and stamped with the stems from a flower stamp using black Versafine ink. I really like how graphic and bold it looks!! I manually embossed some heart shapes using a heart embossing folder. and a hammer. They I over embossed them with the Swiss Dot embossing folder (CB) and added texture all the way around. I adhered this large layer to a red card front. I fussy cut a laser printed chalkboard greeting and added two little heart rhinestones which I coloured with red Sharpies to coordinate with my card. Add the greeting to my card using 3D foam tape and finished it off with three sequins that coordinated!! I am really loving these fun cards!! I have a few more here and here and here.